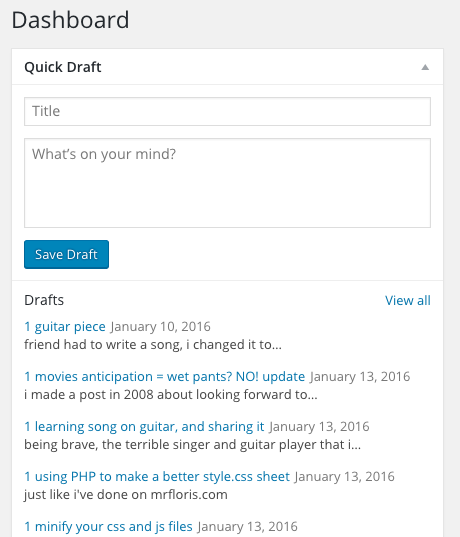 On WordPress sites I always have the quickdraft widget listed on the top left of the dashboard. This way I can quickly throw ideas into the queue, and go back to what I was doing. 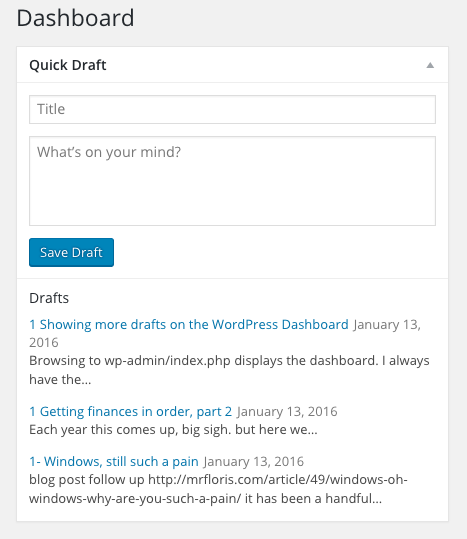 tl;dr The WordPress dashboard has a quick drafts widget. It only lists 3 draft posts, but I like to list quite a few more. This how-to shows you how to customize the back-end code to achieve just that (yay). There is no separate page for quickdrafts as far as I know. And I am a terrible plugin coder when it comes to WordPress. But if I am allowed to do it, I change it to display the drafts just the way I like it. There’s a little bug there by the way. It’s hard coded to list 4, but it only will display 3. Which is odd. But whatever, typical WordPress if you ask me. Save the file, refresh the wp-admin/index.php file in the browser and if you have more than 3 drafts, it should now list up to 12 of them.